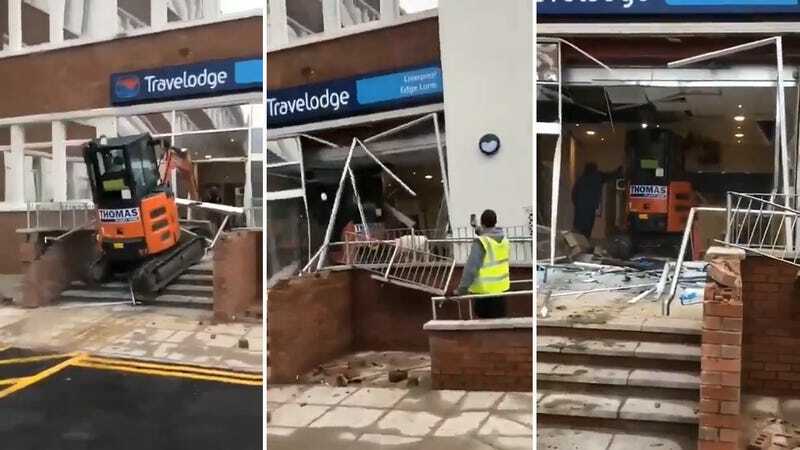 Police are still looking for the driver of the digger in a now-viral video, smashing up the lobby of a freshly-finished Travelodge in the UK, reportedly over not being paid for £600 worth of work. Please take in the absolute symphony of heavy accents in this video, shot in Liverpool yesterday. “That’s what happens when people don’t pay their wages,” I can make out, though the rest is lost on me. Ceiling fixer Samuel White, 24, said: “The handover was today, everything completed, we’d put the last tile in, cleaned up and made sure everything was perfect. “Then some idiot in a mini digger decided to drive through the middle of the building. “There were loads of workers outside all gobsmacked, jaws to the floor wondering what’s going on. Other builders said the driver, who was owed £600 for his work on the project, flew into a fit of rage over not receiving the money. However, members of the public have now chosen to crowdfund for the man in a bid to cover what he is owed and any legal fees that may arise as a result of the damage. “Many people in the building trade encounter similar situations week in week out and this guy has helped MANY tradesmen and workers to get paid on time and to stand up for themselves when its [sic] really needed,” the fundraising page said. We will update this story as we receive more information from the police, or if bro gets his money.